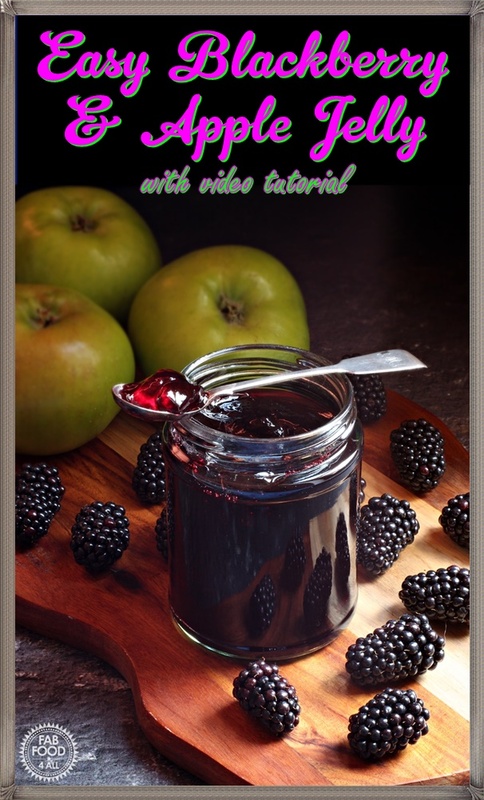 You are here: Home / Breakfast / Easy Blackberry & Apple Jelly with step-by-step video tutorial! 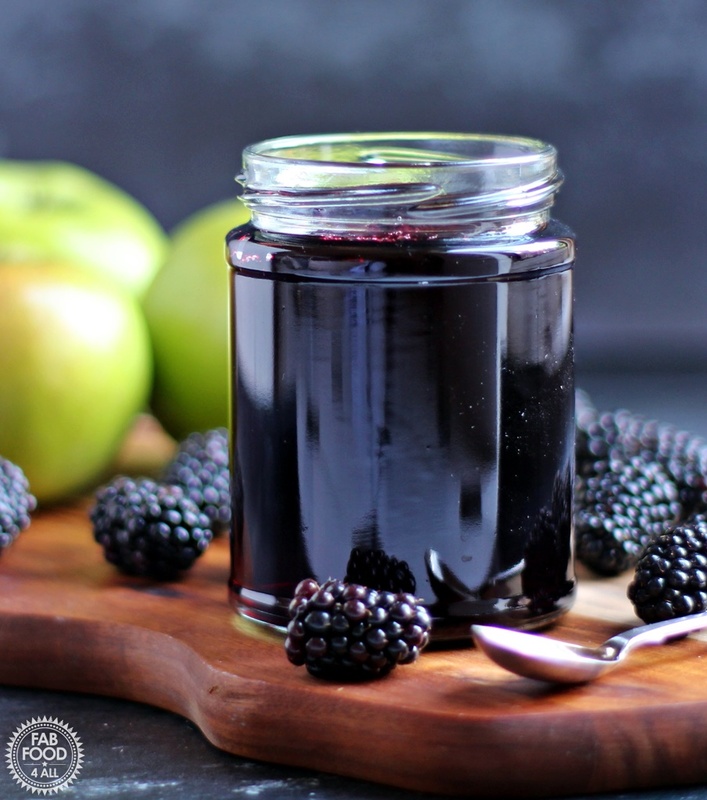 Today I’m sharing with you my Easy Blackberry & Apple Jelly with step-by-step video tutorial but perhaps I should have called it Bramble Jelly? I have to admit to having had a mental block where jelly was concerned. It just conjured up images of upturned stools, muslin or jelly bags and as I didn’t own any of these I gave up without even looking into the subject further. However, my appetite to make jelly was whetted recently by seeing lots of chatter about jelly on Facebook, so I decided to grab the bull by the horns and get over myself! At the back of my mind I remembered seeing mention of being able to use tights to make jelly so after a quick Google for images I drew a blank but there were mentions of using tights at least. Turns out you can use so many things to strain the cooked fruit in jelly making ranging net curtains, tea towels, muslin, jelly bags, conical fruit strainers etc. So, with no detailed instructions about the tights (I couldn’t just fill them as I didn’t have a stool to hang them from) I embarked Blue Peter style on making a strainer with a colander. First, I found a brand new pack of 40 denier tights (any denier will do), I say brand new, they were from the closing down sale at Safeway some 15 years ago LOL! Pleased to finally put them to good use! Then I took my colander and popped it into the tights, tied the legs to one side in a knot and then trimmed off the legs. That took all of 20 seconds, so at this point I’m feeling a little stupid for never having pursued jelly making before now. The next thing I needed was something to suspend the colander over that was deep enough to catch the drips of juice without touching. This turned out to be the pan I use for preserving itself! 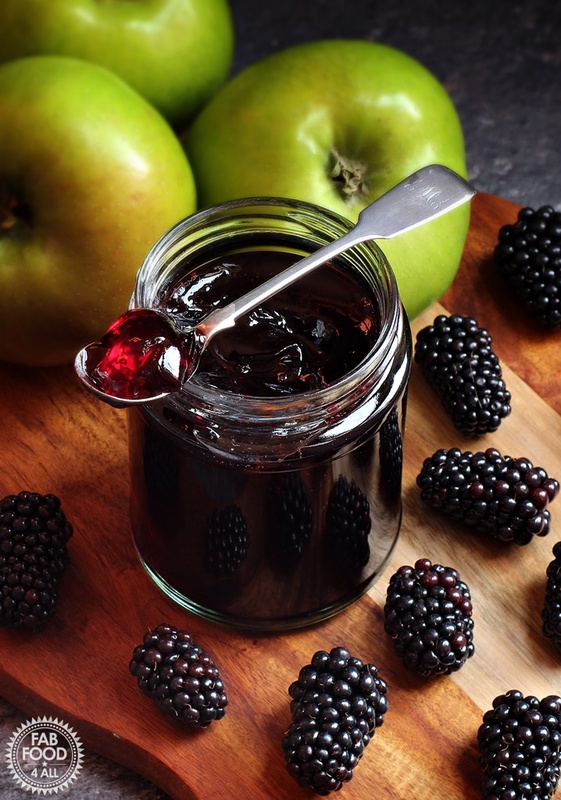 I came across reduced blackberries and Bramley apples last week so as I’ve already shared Easy Blackberry & Apple Jam I decided to embark on Easy Blackberry & Apple Jelly. I noticed the blackberries in our local park are just starting to ripen so it’ll soon be time to forage for free blackberries (which is what I usually do)! 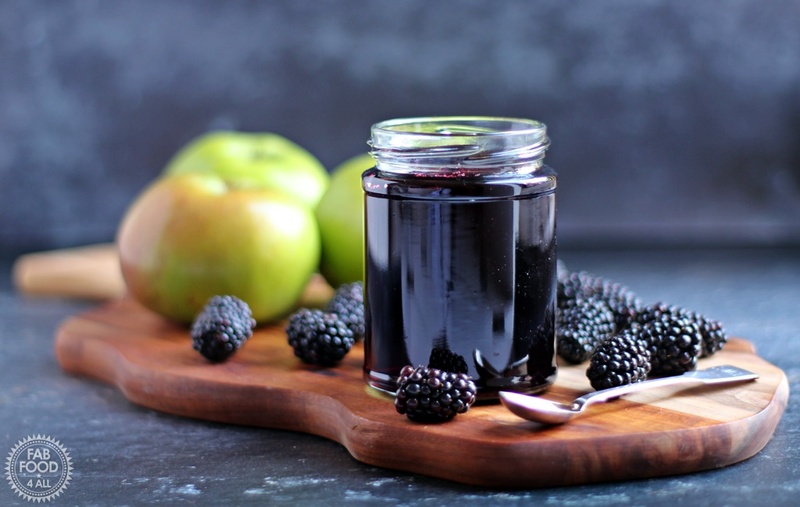 Hopefully, if you’ve been like me and avoided making jelly because it all seemed too complicated, this recipe will persuade you to think again. 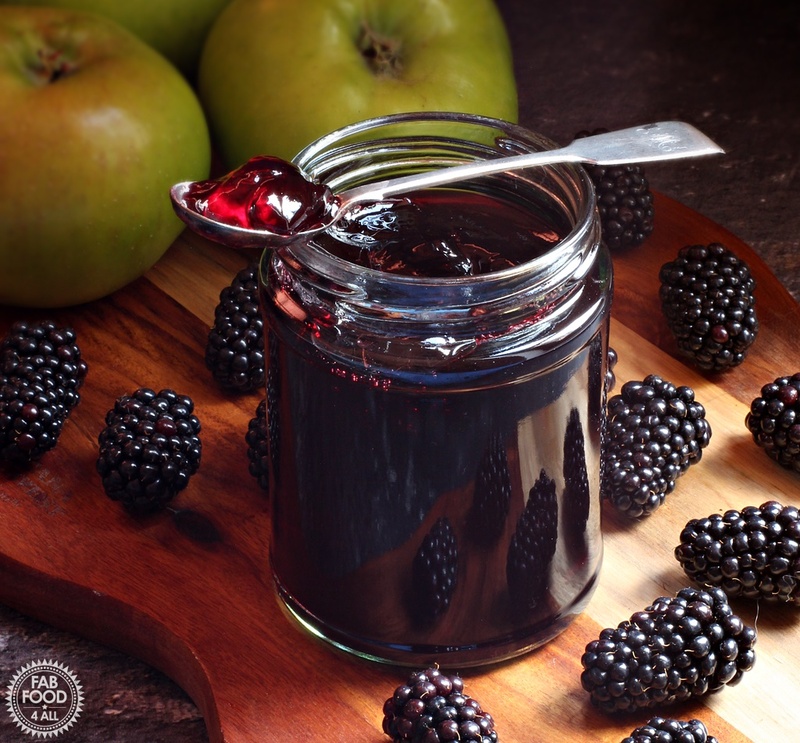 So, what did my Easy Blackberry and Apple Jelly taste like and what can you use it for? Well hubby was first to try it on a scone and immediately gave it his seal of approval with “this is good”! He hates seeds in jam so a jelly is ideal for him. You can spread this and use it like you would jam but you can also serve it with cheese. 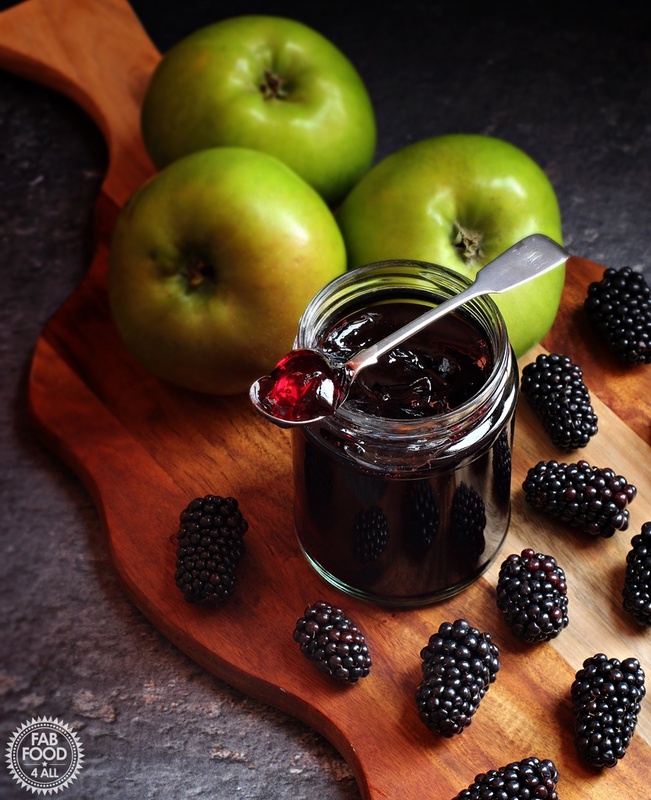 I love the flavour and also the jewel like quality and purity that you don’t get with jam. 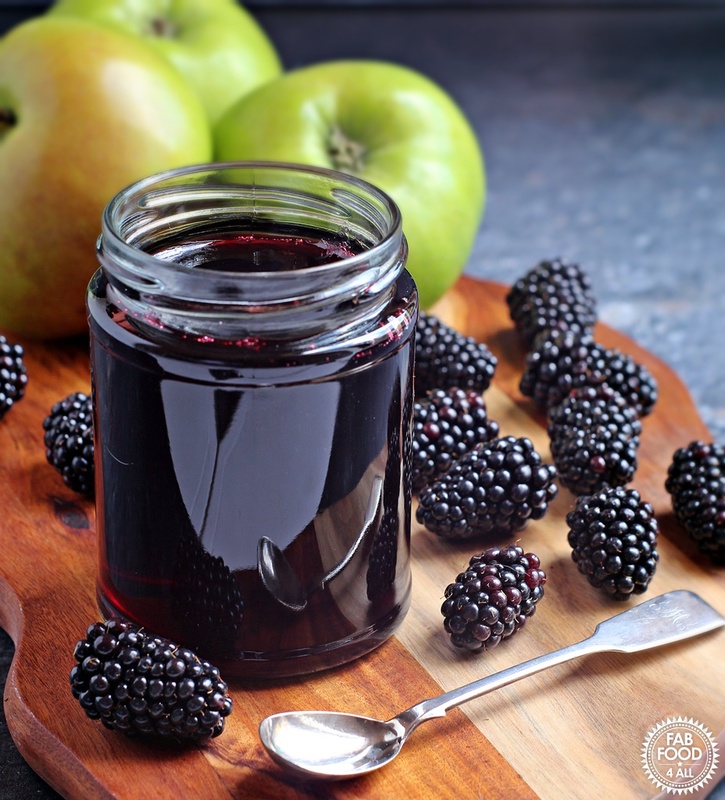 This recipe follows the principle of equal weights of blackberries and apples so you can easily reduce the amount of fruit to what you have. I made just over 8 x 300 ml jars and found that at a rolling boil the jelly was reaching the top of my pan so you definitely wouldn’t want to increase the size. I actually had no idea how much jelly I was going to get so was busy washing and sterilising more jars when I realised I didn’t have enough! 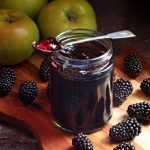 If you like giving homemade preserves as Christmas presents then this Easy Blackberry and Apple Jelly recipe is ideal. Avoid hexagonal jars, they can easily trap air bubbles. You can hold your jars at a slight angle when potting up to avoid trapping air bubbles around the neck. Avoid over boiling, this may result in a jelly with tiny air bubbles trapped inside. If you find your jelly hasn’t set, just tip it back into your pan, re-boil and do the plate test again. Don’t under any circumstances be tempted to squeeze the fruit when straining, this will give a cloudy jelly. Jelly making follows the same principles of jam and relies on pectin to set so low pectin fruits will need lemon juice or additional pectin. 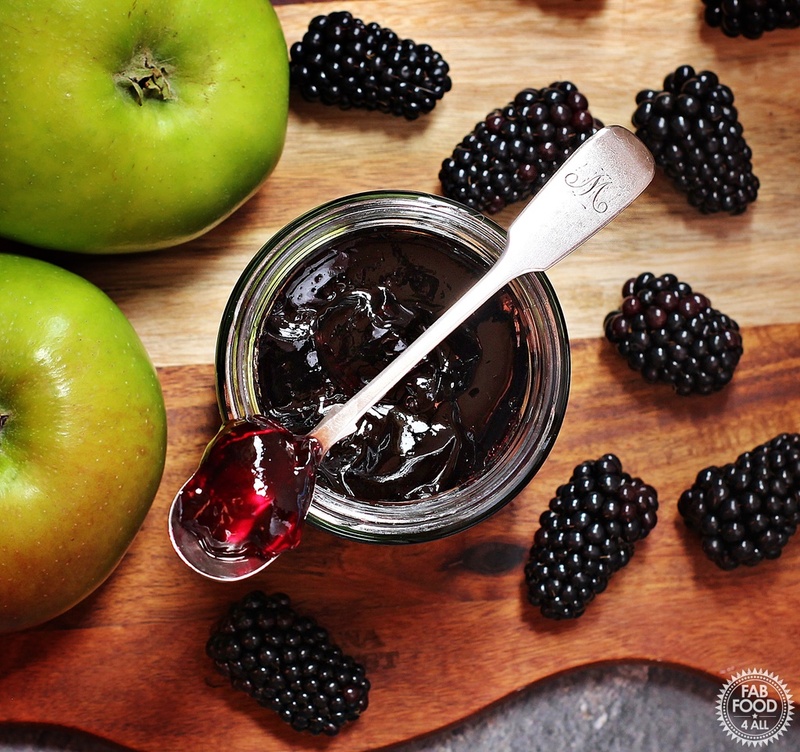 Why not pin my Easy Blackberry & Apple Jelly for later? Soak and rinse the blackberries to get rid of any insects etc. Cut the apples into dice (don’t peel or core). Place the fruits into a preserving pan or similar with enough water to barely cover. Gradually bring to the boil and then simmer for 1 hour (uncovered). Strain the fruit (see notes) and leave for at least 2 hrs or overnight covered with a tea towel. (Do not under any circumstances be tempted to push or squeeze the fruit, this will result in cloudy jelly). Measure the juice and stir in 450g or granulated sugar for each 500 ml of juice. (Mine measured 1.85 ltr to which I added 1.665 kg sugar). Once the sugar has dissolved slowly bring the pan to the boil and once at a rolling boil, time for 20 minutes, then take off the heat. Push you finger through the jelly and if it crinkles and forms a gel like clot which you can tip over then it’s ready. If not carry on boiling for 2 minutes and repeat plate test until set achieved. Then pot up into hot sterilised jars (see notes) using a ladle and jam funnel if you have one and place lids on immediately. Store in a cool, dark place and once opened keep in the fridge. Unopened jars will be good for at least a year and most likely much longer. To make a strainer if you don’t have a jelly bag etc, put a colander into a new pair of tights, tie the legs into a knot on the side and snip off the excess. You could also line a colander with clean net curtains, a tea towel or muslin. 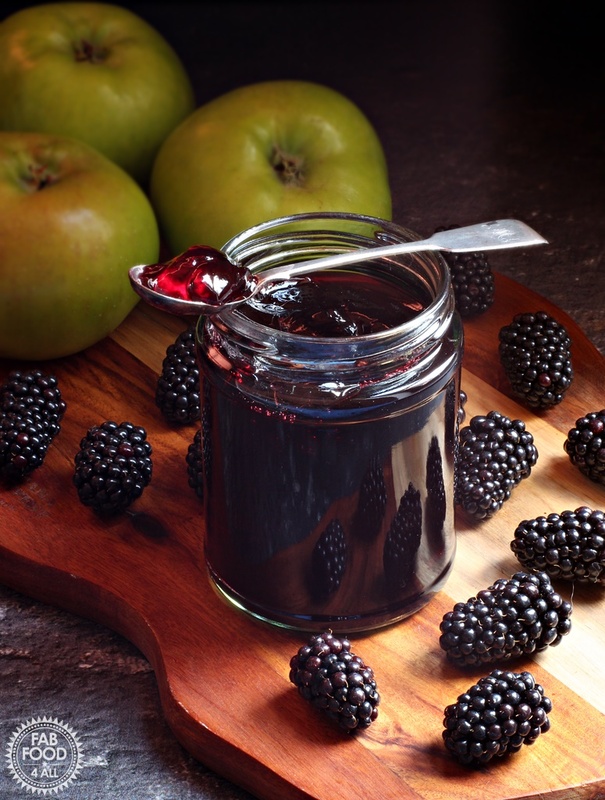 I use to go blackberry picking when I was a child and it has some great memories… Might take this up again if I can make recipes using them like this one!